Lithic Press 2017 38 pp. Trish Hopkinson calls her blog Trish Hopkinson - A selfish poet, but her readers know her as one of the most supportive voices in the writing community. 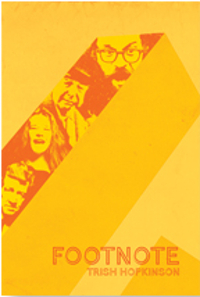 Her chapbook, Footnote, is another example of her inclusive nature. Reading this book is like entering a salon of her favorite poets, filmmakers, and songwriters. Readers are invited to join her discussions with Rumi, Ginsburg, Dickinson, Janice Joplin, David Lynch, and more. The book can be enjoyed at first read for its sonic quality and imagery with lines like "We had not much ––– thin coffee, thin socks," but to fully experience its layers of interplay, the reader will want to dive into bookshelves and video collections for the original artworks and appreciate the intricacies of Footnote. Each of Hopkinson's poems engages her sources. At times, they are wonderful mirrors of form. "Ars Moriendi" is a pitch-perfect tribute to Emily Dickinson's memorial poems. "Rumi said, Poetry can be dangerous” is a joyful pas-de-deux with his poem "Dance." Hopkinson's voice stays true throughout in a unique and vibrant duet with her beloved poets, and at times the contrast between her poems and those that inspired them is resounding. In "Reconstructed Happiness," for example, she employs a reverse order erasure to the Lawrence Ferlinghetti poem "I am Waiting" attesting, "I am wonder," celebrating her life as a woman and a poet. Several different styles of found poetry are employed. "Strange Verses" draws key words from Alice's Adventures in Wonderland. The words are sorted by length from largest to smallest. The resulting reverse snowball poems form a "neverending wonderland” horizontally and vertically. Inspiration is drawn from unique sources such as engravings, film dialogue, a novel, and song lyrics, in addition to poetry. There is humor woven through the work. A poem about Janis Joplin is written from the perspective of a microphone: "She's rocking, cradling my coolness / in her hot, wet hands." The act of writing is described in other pieces as "a maze of metaphors, stuffed in sacks / and piled in rows" or "dueling pistols / of Haiku, in five, / no seven, ok five." Poem leads to poem in the chapbook just like salon talk would tumble from one topic to the next. "And Finished knowing –– then ––" is a poem inspired by Emily Dickinson's "I felt a Funeral in my Brain." Hopkinson takes off where Dickinson's poem ends; imagining what might happen after a person is buried alive, evoking Edgar Allen Poe's The Premature Burial. It is no surprise that a Footnote poem follows with a visit to Poe's house. This piece leads to one about a section of Joyce's Ulysses where Bloom attends a funeral. The reader arrives full circle with Hopkinson's elegy to Emily Dickinson, "Ars Moriendi," which is rich with imagery of Dickinson's first memorial stone, the lady slippers, and the funeral of the lady in white, who was struck down by Bright's Disease. In "From Her to Eternity," Hopkinson takes on Wim Wenders, Nick Cave and Rainer Maria Rilke. She addresses Wenders' movie, Wings of Desire, its soundtrack by Cave, and Rilke's Duino Elegies. The poem unfolds like an origami, flap by flap, from lyrics, to film dialogue to Rilke's lines, as Hopkinson describes Marion, her angel's love object. She counters Rilke, Wenders and Cave, refuting their visions of ideal love and beauty. Hopkinson's narrator relishes in Marion's fragility, her hunger, her sexuality, and her humanity. Marion "moves within her own subjectivity, her art, her visions, her waking memories." Like Eve in Eden, she names things, defines her reality and by doing so makes the world and a heavenly angel, real and known. The women of Hopkinson's poems suffer and doubt but are not broken. Her versions of Janis Joplin and the women from David Lynch’s films are strong, sexual. We believe they could escape their tragedies. In "Your Scarlet", Hopkinson diverges from the Bible and Ai's versions of Salome, offering a reverse erasure of Ai's poem. Here Salome transforms from an abuse victim to a young woman in sexual awakening. Hopkinson's version seems vulnerable, honest yet hopeful. Was this also a defiant response to Nick Cave's "Salome", whom even his publisher describes as "a ruthless woman who taunts men with her sexuality purely for the sport of sadistic vengeance?" Writing is key to the survival of Hopkinson’s women. The chapbook can be seen as a response to Laura Hamblin’s question in The Eyes of a Flounder: "Where do you live?" Throughout Footnote, Hopkinson answers Hamblin that she lives "in a room made of poetry." In this room, as in the book, she gathers the artists she loves and examines their work from a feminist perspective. There is joy, self-exploration, and a sense of affirmation. Where Hamblin despairs, Hopkinson replies with a hope born through writing. Artistic expression can battle isolation and break through societal barriers. Hopkinson tells Hamblin and readers that in the darkness there are only the ifs of endless possibilities. In "Whimper," she declares, " I turned thirty & left god roadside to hitchhike his way home." The journey of self-discovery is over. She ends the book with a delightful response to Ginsburg's "Footnote to Howl", in a joyous celebration of the all the daily details of a writing woman's life. She counts her crow's feet, picks her own grapes, her own shower curtain and husband. Like this chapbook, life is uniquely holy and good. 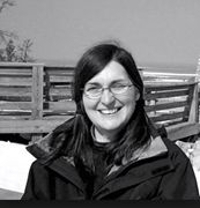 Janeen Pergrin Rastall is the author of In the Yellowed House (dancing girl press, 2014) and Objects May Appear Closer (Celery City Chapbooks, 2015). She is a co-author of True Companions (Gordon Publications, 2017) and Heart Radicals (About Editions, 2018). She has been nominated multiple times for the Pushcart Prize and the Best of the Net Award.